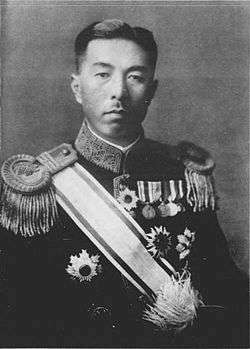 Prince Fumimaro Konoe (近衛 文麿, Konoe Fumimaro, often Konoye, 12 October 1891 – 16 December 1945) was a Japanese politician in the Empire of Japan who served as the 34th, 38th and 39th Prime Minister of Japan and founder/leader of the Imperial Rule Assistance Association. He was Prime Minister in the lead-up to Japan entering World War II. Prince Fumimaro Konoe was born into the ancient Fujiwara clan, and was the heir of the Konoe family in Tokyo. His younger brother Hidemaro Konoye was a symphony conductor. Konoe's father, Atsumaro, had been politically active, having organized the Anti-Russia Society in 1903. In 1904, Atsumaro's death left Konoe, at the age of 12, with the title of Prince, plenty of social standing but not much money. He studied Marxian economics at Kyoto Imperial University. In 1916, he automatically became a member of House of Peers according to his hereditary title. Prince Konoe successfully lobbied to be included in the Japanese delegation to the Paris Peace Conference, 1919. In 1918, prior to Versailles, he published an essay titled "Reject the Anglo-American-Centered Peace" (英米本位の平和主義を排す). Following a translation by American journalist Thomas Franklin Fairfax Millard, Japanese political advisor Saionji Kinmochi wrote a rebuttal in his journal, Millard's Review of the Far East. In 1925, Konoe gained favorable public attention by supporting a bill extending suffrage to all males aged 25 and over (see General Election Law). In 1933, he was elected President of the House of Peers. He was awarded the Grand Cordon of the Order of the Sacred Treasure in 1934. 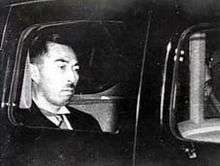 In June 1937, Prince Konoe became Prime Minister. One month later, Japanese troops clashed with Chinese troops near Peking in the Marco Polo Bridge Incident. Konoe dispatched three divisions of troops, admonishing the military to be sure not to escalate the conflict. Within three weeks the army launched a general assault. 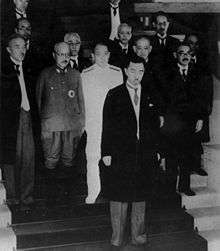 Konoe and his cabinet feared that Japanese troops would not respect any peace agreement. He was also unsure that Chiang Kai-shek could control his own forces. 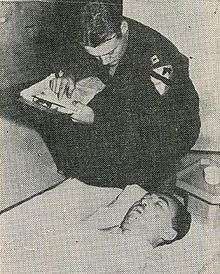 In August, Chinese sentries killed two Japanese marines who crashed a gate at a Chinese airfield in Shanghai. Konoe agreed with Army Minister General Hajime Sugiyama to send two divisions to defend Japanese honor. 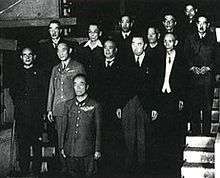 His cabinet then issued a declaration, accusing both nationalist and communist Chinese of "increasingly provocative and insulting" behavior toward Japan. In December, Imperial General Headquarters, a structure completely autonomous from the elected government, ordered its forces in China to drive toward Nanjing, the Chinese capital. Nanking was captured within a few weeks, after which the Japanese Army committed the infamous Nanjing massacre, killing upwards of 250,000 civilians. Japanese victories continued at Xuzhou, Hankow, Canton, Wuchang, Hanyang – but still the Chinese kept on fighting. Konoe, stating that he was tired of being a "robot" for the military, resigned in January 1939, and was appointed chairman of the Privy Council. Kiichirō Hiranuma succeeded him as Prime Minister. Konoe was awarded the 1st class of the Order of the Rising Sun in 1939. Following the fall of France, Japan stationed troops in French Indochina in September 1940. On 27 September 1940, the Tripartite Pact was signed, aligning Japan, Germany and Italy. Konoe played a role in the fall of the Tōjō government in 1944. In February 1945, during the first private audience he had been allowed in three years, he advised the Emperor to begin negotiations to end World War II. According to Grand Chamberlain Hisanori Fujita, Hirohito, still looking for a tennozan (a great victory), firmly rejected Konoe's recommendation. After the beginning of the American occupation, Konoe served in the cabinet of Prince Naruhiko Higashikuni, the first post-war government. Having refused to collaborate with U.S. Army officer Bonner Fellers in "Operation Blacklist" to exonerate Hirohito and the imperial family of criminal responsibility, he came under suspicion of war crimes. In December 1945, during the last call by the Americans for alleged war criminals to report to the Americans, he took potassium cyanide poison and committed suicide. It was 1945, exactly 1300 years after his ancestor, Fujiwara no Kamatari, led a coup d'état at court during the Soga clan. His grave is at the Konoe clan cemetery at the temple of Daitoku-ji in Kyoto. ↑ Although -- in accordance with the system adopted by the Japanese imperial government from the Meiji period through the end of WWII -- the official English translation of Konoe's title was "prince," the title of kōshaku (公爵) was actually a closer equivalent to "duke." Wikimedia Commons has media related to Fumimaro Konoe.